Most of us do not realize how many people are employed in the informal economy and how much they contribute collectively to the urban and national economy. As huge as the informal economy is, governments rarely plan for or accommodate informal workers. Economists, urban planners and development practitioners have long assumed that with development, the informal economy would wither away. But this has not happened – the informal economy is large, diverse and persistent. 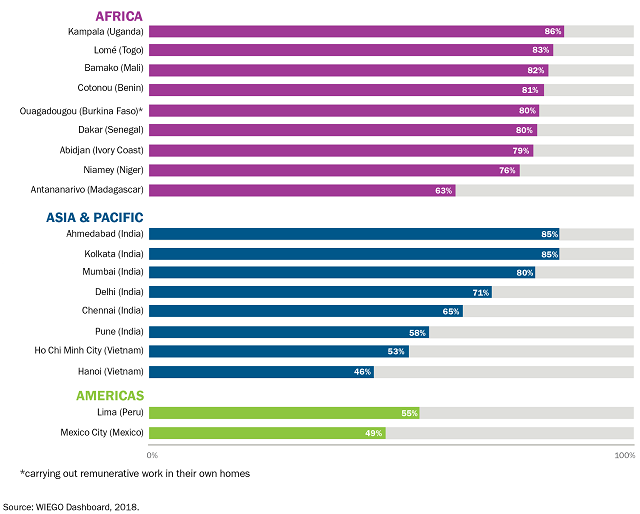 In a new World Resources Report paper, we focused on three types of informal workers—home-based workers, street vendors and waste pickers—who represent a significant share of the urban self-employed who are directly impacted by city policies. The paper highlights several examples of inclusionary policies and practices which have resulted from the successful collaboration between inclusive cities and informal worker organizations. Rattana Chalermchai works with her husband, Mongkol, at home in Bangkok. She supplies hand-made flip-flops to a resort. She and her husband are long-time members of HomeNet Thailand, and have contributed to several policy campaigns for informal workers. Through HomeNet, they have also helped Thailand’s home-based garment workers to officially register themselves as a garment cooperative. As a legal entity, the cooperative has broadened opportunities to get work orders, and more importantly, strengthen a movement of home-based workers. Photo by Paula Bronstein/Getty Images Reportage. 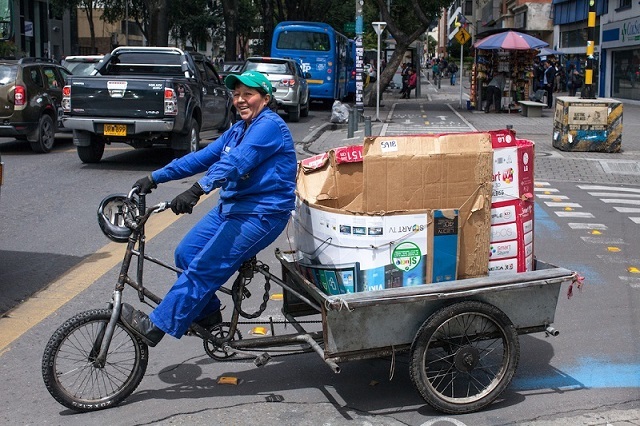 Sonia Janeth Barriga, a waste picker member of Asochapinero – an affiliate of the Asociación de Recicladores de Bogotá, an organization of waste pickers’ associations and cooperatives that advocates for waste pickers’ rights – transports recyclable materials with a tricycle. 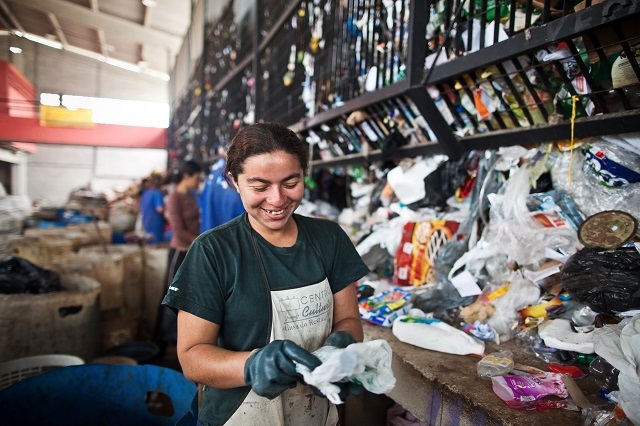 In this neighborhood, Chapinero, she has negotiated with building administrators, neighbors and hotel managers to be able to collect their recyclables. Being part of an organization has been instrumental to her success in these negotiations. Photo by Juan Arredondo/Reportage by Getty Images. Cities need to examine their policies and practices with a view to empowering informal workers. That means first stopping the practices that negatively impact informal work, such as harassment, evictions and relocations. Second, in a more positive approach, cities need to actively support informal workers by providing access to public goods and public spaces, social protection and improved services. Finally, and most importantly, they must give informal worker organizations a seat at the policy table. Including the voice of informal workers (and other stakeholders) in the formal processes of urban governance is the best way to negotiate policies and plans that balance competing interests and promote social justice. Valeria Gelman is Communications Specialist and Program Coordinator II for World Resources Report at WRI Ross Center for Sustainable Cities.